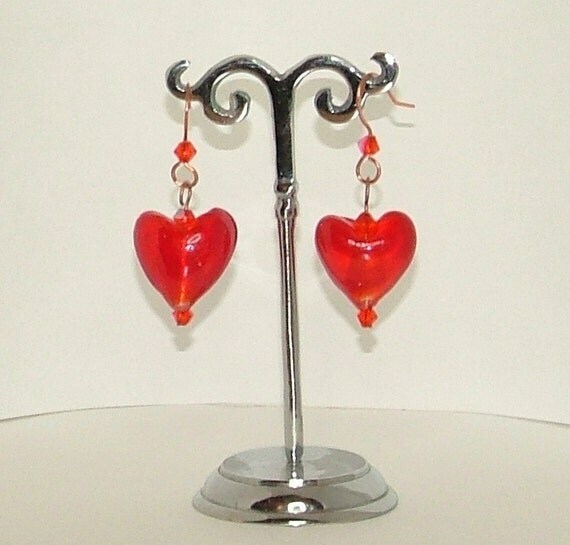 This cute pair of dangly earrings will appeal to any princess's girly, romantic side with their shimmering red hearts. Use them to add a bit of sparkle when you're feeling romantic. Ideal, with Valentine's day coming up. The earrings measure approx 5 cm / 2 ins long from the top of the ear wire to the end of the beads. I made the fish hook ear wires from 0.8mm copper wire and decorated them with tiny red glass bicone beads. Each earring has a single dropper consisting of a 14mm heart shaped glass bead finished top and bottom with a 4mm glass bicone bead to match the ear wire. The beads all have a slight blue shimmer. Folksy :: Buy "Silver and red heart charm dangle earrings"
Folksy :: Buy "Rose Heart Necklace"